I don't think I could have gotten through the last 9 months without ASOS Maternity. Seriously, it feels so good to be in 'normal' clothing and feel somewhat like myself! 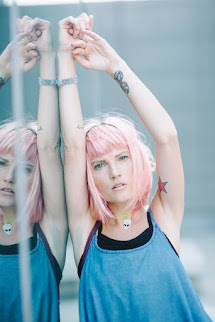 With my new pink hair, ive been LOVING wearing denim, so this little denim dress from ASOS has been perfect. I paired it with some awesome little booties from CAT FOOTWEAR, and a clutch to keep everything together. I think I'll be holding on to this dress after the baby - it will transition right back into my fall wardrobe! ASOS maternity is so fitting for you and your bump! !